The change of plans has to do with the Ukrainian draft law "On education". 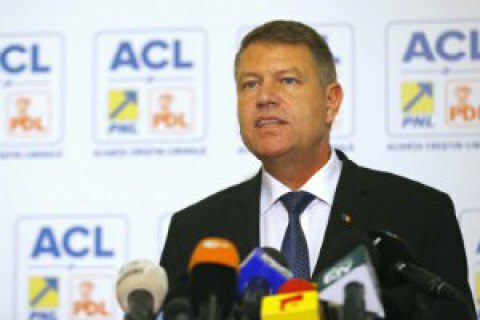 Romanian President Klaus Iohannis has said that he has cancelled his official visit to Ukraine over its recently adopted draft law "On education". He said this at a news conference before leaving New York for Bucharest, according to Ukrinform. "I decided to cancel my visit to Ukraine upon learning about the adopted law 'On education'. Also, I cancelled a meeting with the Ukrainian parliament chairman, which was scheduled for late September," he said. Iohannis said that thorough preparations had been underway for his October visit to Ukraine, however he was "bitterly surprised" by the adoption of the draft law by the Ukrainian parliament "without any preliminary discussions with Ukrainian partners". In his words, the draft law "practically… strictly restricts the rights of national minorities to be taught in their mother tongue". He recalled that there are around 400,000 Romanians in Ukraine. Iohannis said he shared his concerns with Ukrainian President Petro Poroshenko during their brief meetings on the fringes of the UN General Assembly. Yesterday, the Romanian parliament issued a declaration on the protection of national minorities in Ukraine, in which it expressed hope that Ukraine will meet European standards in this regard after the adoption of the law "On education". The Ukrainian parliament adopted the draft law "On education", which in particular regulates the issue of the language of study. Children from national minorities will be able to study in their mother tongue in primary school but starting from the fifth form, they will be able to continue studying the language as a separate subject. Governments of countries represented by large diasporas in Ukraine protested against the draft law.